I finished Waldo in overtime (18:39) in 2004, in my second attempt, and three tries since then have not taken me past the last cutoff at Twins2. I decided that this year would be my last attempt, finish or no, but that I would make a finish at Waldo my main priority for the year. Waldo has been my favorite race since my 2004 finish, and I have intended to run it every year. In 2005, I opted instead to try the Cascade Crest 100 (DNF), and in 2006 I paced my friend Tom Pelsor to a successful finish. I was back as a starter in 2007, but was basically undertrained, and sat through the Charlton cutoff in the medical tent with palpitations. 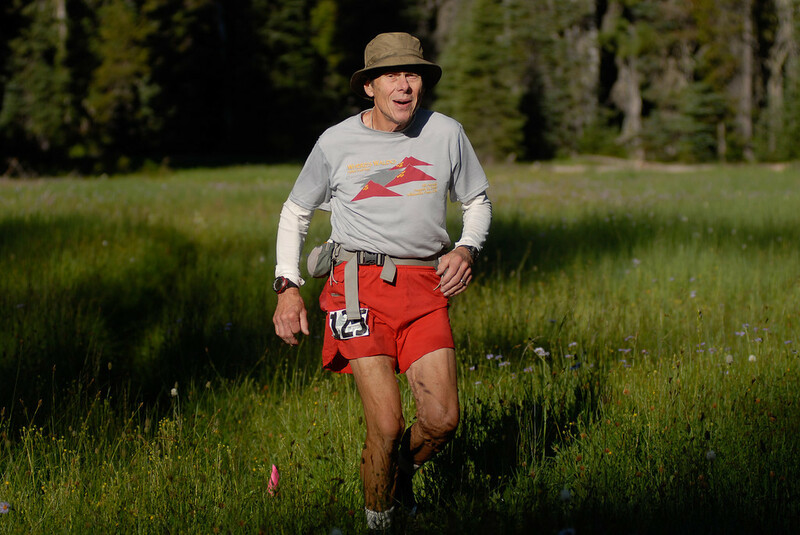 In 2008, I signed up to pace Tom at Leadville, but came back to Waldo in 2009 determined to finish. A major bonk on the way to Twins2 led to my first encounter with the sweeps in any race, and my determination to finish was transformed into a determination to never run again. Fortunately, on the way home the next day it occurred to me what had happened. I had been drinking undiluted GU2O all day, and had too many calories and not enough H2O, which made me nauseous and dehydrated at the same time. Armed with this information, I signed up for a rematch in 2010. With my drinking habits modified, and being otherwise well-trained, I was in fine shape until the first climb to the Twins AS, when I developed a nasty blister on my left big toe. I never get blisters, except occasionally on my toes, and all of these were taped. However, I hadn’t used any adherent, such as benzoin, and the tape on the big toe had come off, so for the first time in my life I stopped at an aid station for blister repair. This was accomplished very deftly by a fellow named Bill, but unfortunately it took about 15 minutes, and an additional 8 minutes spent trying to find a lost glove on the way to Charlton brought me into that AS 2 minutes after the cutoff. By this time, any sane person would have given up entirely on Waldo, and devoted himself to some less troublesome activity such as kiteboarding or skydiving. However, all these experiences had failed to convince me that I couldn’t do Waldo, because in every case, there was a different reason why it didn’t work out. So one last try was in order, and hopefully no new difficulty (such as a blizzard) would emerge to thwart me. As you get older, you have to work harder. Accordingly, since 2004 I have increased my mileage by about 15%, from about 200/month to about 240. During the last couple of years, I started doing hills consistently, at around 5-8,000 feet of climb per week. After the Siskiyou Out Back 50K (July 9), I laid out a training program for the 7 weeks leading up to Waldo. My mileage for the year, before SOB, was 1452. Another event that contributed to my training was a fund-raiser for a local skatepark, in which I ran my age (75) on a track in a little under 24 hours. Over the years, I have tended to travel lighter whenever possible. In this race, I wore the same clothing from start to finish: the 2010 Waldo T-shirt over a light long-sleeved shirt (helpful against the voracious mosquitos), Race-Ready shorts, Injinji socks under Thorlo crew socks (no blisters this time), Inov-8 Talon shoes with Joe Trailman gaiters, and the hat I always wear. I had a Nathan 2-bottle pack with one bottle of water and one of GU2O, a film canister full of S-Caps, a flask of Hammergel, a Ziplock with some candied ginger, and a Clif bar (all these renewable from drop bags), and had 4 containers of Ensure in my drop bags. I had a pair of trekking poles with my drop bag at Rd. 4290, which I hoped would get me up the hill to Twins 2 (and Maiden Peak). I started with a Petzl Black Diamond headlamp and a Streamlight 7 LED, and had one of each in the 4290 bag for the finish (NFI in any of these products). A couple of months before, my son Jeremy called to ask about the Waldo race. He had intended to sign up for it himself, but found that it was already full. I immediately suggested that he consider pacing me there, as it would give him a good idea what the race was like in preparation for doing it next year. He readily agreed, and after he came up from his home in Moraga on Thursday, we rode up together on Friday to our lodging at Odell Lake Resort, where I usually stay. I believe his presence was a major factor in my finishing, not only for the pleasure of having his company during the second half of the race, but also for the incentive it provided me to stay on schedule and arrive at the pickup point at Charlton in good mental and physical condition, and to push through to the all-important 4:30 PM cutoff at Twins2 (about 45 miles). As it turned out, this was his first experience at the ultra distance, a tough 50K or so, although the year before we had hiked a total of about 45 miles in a week in the southern Sierras, during which he had carried a 60-pound pack over some very hilly terrain, so I had no doubt that he was more than equal to it. For each leg of the course, I’ll show my actual split, and the projected time in parentheses. Gold Lake, 7.4 miles: 1:51 (1:57), starting off at 3 AM, a very mild moonless morning, with a short steep climb up the ski access road, then a long downhill through the woods. I was relieved to pass without incident the sudden upturn where I fell and cracked a rib in 2009. I very quickly moved into dead last place, and saw very few people going in the same direction for many hours. I filled my bottles quickly at the AS and headed out, glad to be a few minutes ahead of schedule. Fuji Up, 5.0 miles: 1:38 (1:35), almost continually uphill through the forested slopes, past several small lakes that gradually came into view as the sky lightened. I left my bottle pack at the AS, gladly accepting a spraying with mosquito repellent, as the bugs were out in strength in this wetter-that-usual year. Fuji Down, 2.5 miles: 0:52 (0:51), feeling strong going up the winding trail to the summit, which is never visible until you’re there. Shortly before the top, at a switchback, I was passed by Dave Mackey, the leader, at exactly the same point where the leaders caught up with me last year. Then there were three of them, but Dave was all alone and quite a ways in front. On the way down, I gave ground to quite a few speedy runners from the regular start, who had gained 15 miles on me in only 2 hours. Still very close to my schedule, I picked up my pack and headed for Mt. Ray. Mt. Ray, 5.6 miles: 1:29 (1:35), after descending for a mile or so from the Fuji station, the trail follows the grade for several miles, then goes down, steeply at times (you’d hate to have to climb up it) to Mt. Ray, and I was able to run relatively briskly for much of this part, the easiest on the course, with very nice footing on the forest trail, and arrived at the Mt. Ray station 8 minutes ahead of schedule. Having regular start runners passing me continually probably helped me pick up the pace. Twins 1, 6.6 miles: 1:56 (1:57), a long uphill slog through pleasant terrain, with some zig-zag moves onto the Pacific Crest Trail that have occasionally thrown runners off course in the past. At one point you are heading more or less south in what feels like the wrong direction, and I lost some time there in 2004 before meeting another runner who straightened me out. (The course, incidentally, is extremely well marked, with people at the intersections to guide you in the right direction). As always, the aid station appears at the last minute, just when you’d just about given up on it. Last year, everyone was in angelic garb, and I felt as though I’d died and gone to heaven while I was getting my blister repaired. This year, I didn’t dilly-dally, noting with pleasure that I was still a little ahead of schedule and still feeling good. Charlton, 4.9 miles: 1:24 (1:20), the Twins AS breaks up the climb, but it continues for what feels like too long before dipping down to the lake. The first time I did this leg, in 2003, the distance was marked as 4 miles, and I had an hour until the cutoff. No problem, I thought, then I climbed for about 40 minutes wondering how they got a lake way up here, before finally reaching the top and running pell mell down to the Charlton AS 15 minutes late. This time, I had a better idea of the task, and came in about 5 minutes ahead of my scheduled 12:15 arrival despite losing a few minutes. 4290, 5.2 miles: 1:40 (1:35), it was good to see Jeremy. He had been following my progress, and was pumped up that we were making such good time. This leg is one of my least favorite parts of the course, although the mild weather kept it from being as hot as usual. It’s partly a clear-cut section, rather brushy, without much shade. This was where I started to fade in 2009, when I needed more water, instead of the full-strength GU. This time, my pace was slowing down somewhat, but I was still feeling strong, and it was pleasant to have some company and catch up with my son, who I hadn’t seen for months. When we got to the AS, I sat down to have some soup (I think) while Jeremy undid my trekking poles, which were packed in a mailing tube. When we tried to adjust them to the right length, they wouldn’t lock down for some reason, and after the two of us and one of the AS guys struggled with it, I said “forget it, let’s go!” and we took off, having lost 11 minutes at the AS. Twins 2, 7.5 miles: 2:38 (2:30), this is the part of the course that makes or breaks you, although it doesn’t break you quite as badly as it did on the original course, when you had to summit the Twins. This took me nearly 3 hours in 2004, and considering the time lost at 4290, 2:38 was not a bad time, especially given the frequent patches of snow near the top. As we got over 6000, I started getting tired and feeling the altitude, and began taking brief pauses of a few breaths at every 100 feet of climb (measured by my Suunto altimeter, a piece of gear which I forgot to mention). At the top, where the trail heads down to the AS, we met a couple of people who said the station was about a mile away. At that point, we had about 13 minutes to the cutoff, and I started to run. Jeremy joined in, and we kept up a brisk pace for about 7 or 8 minutes, having no idea how far we actually had to go. It’s hard to be discouraged when you’re running as fast as you can, but we really started doubting that we were going to make it. Jeremy said he’d go ahead and find out how close we were, and he took off. He was a 4:20 miler in high school, and at 47 he can still fly. A couple of minutes later he came tearing back around a turn and gasped that it was really close, so we turned on the afterburners and blew in to Twins at 4:28 PM, with time to fill our bottles and head out (we had been informed at the runners’ meeting that cutoffs would be strictly enforced on leaving the station). Everyone there cheered us on lustily (as was the case in every aid station for the rest of the race). We had passed a couple of people on the way down, but we were the last ones to make it through. Maiden Peak, 5.2 miles: 1:44 (1:36), after that dramatic incident, we were fairly casual during the easy trip to the Maiden Peak AS, where Jeremy saw the downhill section on the PCT that I had come up earlier in the day. Mostly hiking now, we were still close to the projected schedule, but falling a little behind. certainly the latest runners ever to reach the summit during the race. It was quite beautiful. When we descended, we were able to tell the man directing traffic to the Leap of Faith trail that his long day’s work was done. When we reached the aid station, we were greeted with cheers and encouragement, to an extent that I never experienced during a race. Perhaps it was mixed with relief that the old guy was finally getting through, but it seemed pretty heartfelt to me. Finish, 7.5 miles: 2:35 (1:56), a very easy section to run, but impossible at that point in the race. In 2004, it took me 2:04, 8 minutes longer than projected. This time was considerably longer, but we were steady at about 21 minute pace, Jeremy leading the way, then me, then a small but cheerful crowd of sweeps and other volunteers going home for the night. This section almost seems like a repeating loop, rolling up hills and down the other side, all looking pretty similar in the dark. At last we hear the traffic on the highway and see a few lights and buildings. As we went under the ski lift, Jeremy said I should go in front to the finish, so I went ahead, and suddenly started to run as I saw the finish line. s I went faster and faster, or so it seemed, and tried to be careful not to trip on the rather rough approach: what a spot for a faceplant! But I made it with my dignity intact, in 20:25:53, a course record for age and slowness. There were a surprising number of people there, and they were all most enthusiastic. More surprising still, there was still hot food available, and Jeremy and I sat down to a well-earned hamburger feast. What more can be said? In my 2004 report, I said “if I can do it, your grandmother can do it.” This time, I felt like I was my grandmother doing it. My thanks to Craig and Curt and all the volunteers for a wonderful race, the best of my life, and thanks for putting up with my 7-hour trek from Twins to the finish. I hope this report will be helpful to any other superannuated runner who wants to attempt this monster, and for the sake of the management, I hope you don’t break my time record in the wrong direction! If I do this one again, it will be reversing roles, accompanying my redoubtable pacer/son.